From James Dashner, the author of the New York Times best-selling Maze Runner series, comes an all-new, edge-of-your seat adventure. Eye of Minds is the first book in The Mortality Doctrine, a series set in a world of hyperadvanced technology, cyberterrorists, and gaming beyond your wildest dreams...and your worst nightmares. But some rules were made for a reason. Some technology is too dangerous to fool with. And recent reports claim that one gamer is going beyond what any gamer has done before: he's holding players hostage inside the VirtNet. The effects are horrific - the hostages have all been declared brain-dead. Yet the gamer's motives are a mystery. The government knows that to catch a hacker, you need a hacker. And they've been watching Michael. They want him on their team. But the risk is enormous. If he accepts their challenge, Michael will need to go off the VirtNet grid. There are back alleys and corners in the system human eyes have never seen and predators he can't even fathom - and there's the possibility that the line between game and reality will be blurred forever. What would have made The Eye of Minds better? Something, anything unique. So much repetition of ideas that have been done better. Even Dashner's own Maze Runner ideas were repeated at points here and with worse results. It was exciting and intense, a Dashner staple, but not interesting. Lack of unique world-building and character development. Horrible at voicing female characters. Most characters were lifeless. Just felt very boring. The action and intensity in the pacing keeps you going even when you aren't that interested in the story. I would recommend this audiobook to a friend but it wouldn't be my first recommendation. I read another review on here to skip this book and try Ready Player One by Ernest Cline. I did exactly that and Ready Player One was fantastic if you have about 16 hours to spare in your life. I enjoyed it so much I needed another fix for the virtual reality world and came back to this book. This book was a similar topic but is much shorter(8 1/2 hrs) and almost as good. 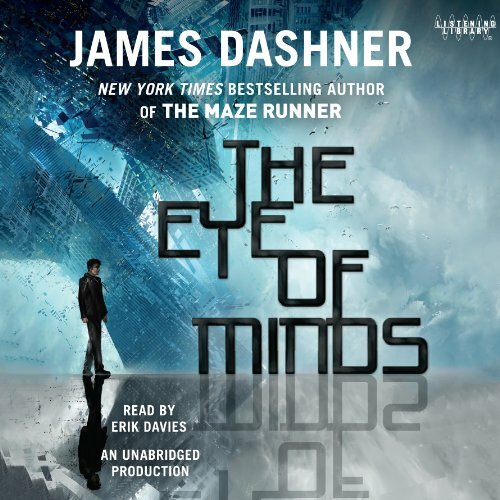 Considering this audiobook came from the author of the Maze Runner series, I was sure it would be good and I was not disappointed until the book was over and there isn't a sequel. Throughout the story, the elements are always changing as the main character(s) travel through completely different "worlds" in the video game with suspense and surprises all the way through the book. If you can get wrapped up in a video game you'll love how this book is set in the virtual reality world where anything can happen. Great Sci-fi book. Would love to see this made into a movie. Great twist at the very end. Enjoyed listening to the narrator. Erik Davies did a perfect job using different voices and sticking to those threw out the whole story so when characters where reintroduced you would be able to recognize them quicker. All the words are used up in the first scene; fear, sweat, pain. Therefore, there is no tension in the rest of the book, just more fear, sweat, pain. The "game" is boring, with no interesting problems, no clues, no excitement, nor innovative solutions. There are long periods of walking through hallways "for hours." The plot is not very original and I found the ending entirely predictable. I seriously considered abandoning the book, but finished it so as to write this review to spare others the pain. However, given that the writing is so bad, the performance is actually quite good. Davies manages to deliver each scene with care, passion, and adds a variety of tone, despite having to read the same words over and over. To help calibrate my review, I thought that Brown's Red Rising trilogy was the best writing and performance in a long time. If you like the Maze Runner series you will likely be disappointed with this book. the story is quite good, its kinda heavy but worth to finish it, long story short I want to continue to the next book. the voice performer its not that good, some impressions sound the same as others characters, making it hard sometimes to understand if its the same or another character. The persons in this story are very annonymious. We do not know much of their past, the society and their general whereabouts. This makes it difficult for the reader to identify with them. Combinding this with endless trials and fights make this book mindless and without spark. Maze Runner clearly shows that the author can do much better. Non-stop intensity. Look forward to next one. Odd ending. Performance was generally good though narrator occasionally seemed to lose track of different voices in rapid dialogue. There is certainly a lot of action and some of it manages to make one overlook the gaping holes (inconsistencies) in the story itself.